Many people don't understand submissive urination in dogs. They may mistake it for a house training problem when it occurs. However, this frustration condition isn't related to house training. Even a dog that is perfectly house trained may have trouble with this issue. In terms of dog behavior problems, dogs that submissively urinate more likely have a problem with socialization, i.e., the dog's interaction with other dogs and people. Why Does Submissive Urination Occur? 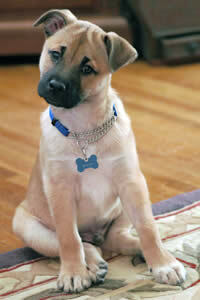 Submissive urination may occur in puppies when a puppy encounters an adult dog who is bigger and much more dominant. The puppy has an impulse to try to appease the adult dog in some way. He doesn't want the big dog to hurt him. He may drop to the ground and roll on his back, for example. Some puppies will start submissively urinating, perhaps out of fear at first. If this makes the adult dog leave them alone, the behavior can become a habit. This same kind of behavior can be transferred to people if the puppy encounters a person whom they perceive as dominating and frightening in the same way as a dominant adult dog. Most puppies do not exhibit this behavior or, if they do, they soon outgrow it. If a puppy continues to submissively urinate you will need to take some steps to help them overcome the problem. Dogs that submissively urinate are generally submissive dogs, as you might expect. These dogs may be more sensitive than other dogs. The dog may be shy or anxious in general, or somewhat timid. Even if your dog is not afraid of you he may urinate when you arrive home because he is anxious. He may urinate when you speak to him or greet him or when someone walks up to him. He will probably urinate if you punish him in any way. If your dog has any history of house training difficulties (for instance, if someone else tried to teach him and failed), he will probably have submissive urination problems. Many rescued dogs also suffer from this condition. This dog behavior problem can be somewhat tricky to solve since the best way to deal with it is to ignore it. If you punish your dog or even scold him for the submissive urination you will only make it worse since you'll be making him more anxious and afraid. If you offer him comfort when he submissively urinates he can mistake the comfort or petting for praise for the behavior and think that you are encouraging it, which is the last thing you want to do. So, the best thing to do is to ignore the problem. Instead, you can work on the dog's anxiety issues. You can build your dog's confidence by working on basic dog obedience training with positive reinforcement techniques. Do not use any harsh training techniques or training methods that use correction or punishment since these dogs have already shown they do not respond well to this kind of training. Focus on teaching your dog simple lessons and keep things positive and cheerful. Teach your dog to sit, stay, lie down and so on. Offer plenty of praise and rewards with each lesson. By teaching your dog these simple lessons you can build his confidence and strengthen your bond. You should also be careful that you don't accidentally assume dominant positions with your dog which could set off the submissive urination. These can include staring at your dog with direct eye contact, walking straight toward him, looming over him, and patting him on the top of the head. Instead, approach your dog from the side and remember to crouch down to your dog's level when possible. Scratch under your dog's chin instead of patting on top of the head. All of these things are less threatening to your dog than direct approaches. As your dog gains more confidence you can begin working on his overall socialization. Take him out with you so he can meet friendly people and other friendly dogs on leash. This should help his confidence. However, don't force him to do things that clearly make him uncomfortable. It will take time to overcome his anxiety. If your dog does have problems with house training remember to avoid punishment and focus on praise and rewards. If you keep things non-threatening and low-key, your puppy (or dog) should be able to overcome submissive urination. He simply needs some time to build up his confidence and learn new ways to cope with other dogs and people.